When the heart wrenching tragedy occurred at Sandy Hook Elementary, in Newtown, Connecticut I made a decision to shield my children from that news. I don’t watch the news often. I don’t enjoy it and seek my news updates via other channels. I didn’t feel the need to unnecessarily scare my children with the details of a man who took it upon himself, for reasons unknown and that will never be justified, to take the innocent lives of those children in the very place they felt safe and surrounded by people whose job it was to care for them. Since we started homeschooling this year outside the United States, our social interaction is limited. I have no idea where my seven year old son got this idea, nor if it is even related to the same horrific event. We spent the holidays in the states and they had plenty of time with other children and grownups so it is possible that he heard something then. That’s neither here nor there. 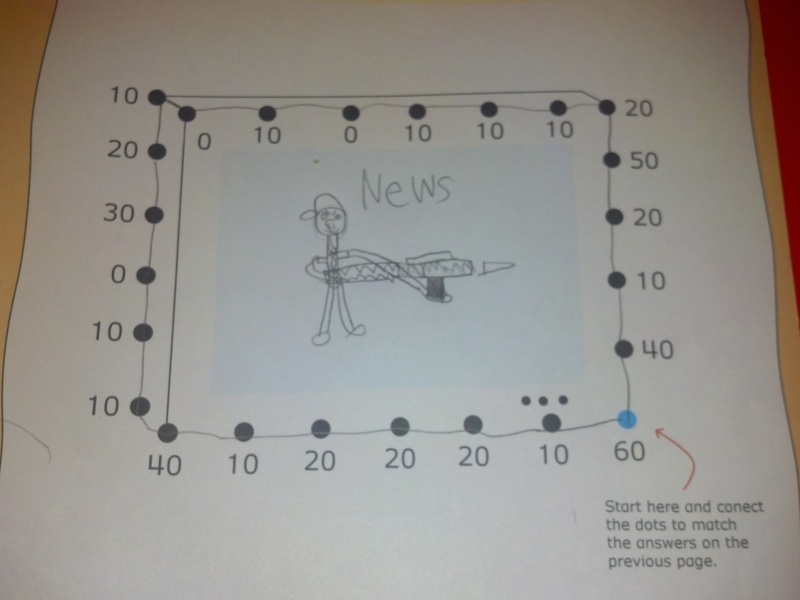 When I saw the picture of the gun my son drew, it didn’t faze me. When he made the statement, “this gun killed someone” my heart stopped. I don’t normally discuss politics, religion or other controversial and divisive topics, and I certainly don’t blog about them. Maybe it’s because I don’t feel the need to change others views or maybe it’s because I don’t feel the need to open myself up to others who might want to try and change my views. I don’t know. What I do know is this. I don’t want my children to grow up believing that a gun is responsible for hurting or killing someone. I don’t want my children to believe that a piece of metal is responsible for taking lives. I want them to understand that a gun is a weapon that can only cause harm if someone takes that gun in their hands and makes the conscious choice to hurt someone with it. He added the person after our discussion on choices. Gotta love the extra long left arm. Our lives are a series of choices. Coke or Diet Pepsi, tropical or winter vacation, the red dress or the black dress. Each choice we make sets off a series of other choices down a path whose direction can change in an instant when another choice is made. From childhood we are presented with choices on a daily basis. PB&J or ham and cheese sandwich? Apple juice or milk? Swing or slide? As we grow so do the choices we are presented with in our lives. We must choose to go to college or join the work force. We must choose with which friends we will spend our time, and which of those friends we will choose to share a lifetime. Some choices we know will be life altering the moment we make them such as whether or not to say “I do” or what career path to take. Others appear to be so inconsequential that we often make them without much thought at all, never foreseeing what kind of domino effect that tiny little choice might set off. We all have at least one friend who prefers to leave things to chance, roll the dice, take a gamble. However, in doing so hasn’t that friend already made a choice? I have heard folks say, “I had no choice” and think to myself that there’s always a choice. If you think someone else has made a choice for you, then you have made the choice to give them that right. We are responsible for the choices we make, no one else. We are responsible for the smallest of choices that can be made in the blink of an eye…sugar or sweet n low? And, we are responsible for the gut wrenching, heart twisting, choices that cause sleepless nights. I choose to teach my children to understand human beings choose to get their hands on a gun, choose to aim that gun at someone else, and choose to pull the trigger, ultimately choosing to end that life. I choose to emphasize the fact that the gun by itself doesn’t kill. A choice was made. Regardless of my stance on gun control, as a parent it is my responsibility to help my children understand the importance of their choices and the effects and consequences those choices may have. Those parents who lost their sweet children that fateful December afternoon had no choice because someone took it upon himself to strip them of the opportunity to teach their children about religion, politics, guns, and their right to choose the path of good vs. evil. Those children will never get to make those choices because of someone else’s choice. I know the topic of guns will be controversial to some, but this post isn’t about gun control or the Second Amendment. It is simply about a mother choosing to teach her children about personal responsibility. At the end of the day, I choose to be confident in my choices and let the chips fall where they may. Let the domino effect begin. What do you choose? Did you choose to discuss the incident at Sandy Hook with your children? If so, how did you handle the role guns and people played in it? Our son is 31, we did discuss these events and how terrible mental disease is, how irresponsible people behave with guns, and all the missed flags leading up to Sandyhook. He is afraid to be around other people who own guns as he feels people are just too careless. This is such a wonderful post! I think about gun control and while I am a supporter I agree with that it is more important to start teaching our children about choices and the consequences that those choices make. Kudos to you for a wonderful job! Thank you Rena. I wish more parents focused on teaching their children the consequences of choices and more importantly that there is ALWAYS a choice. Guns don’t kill people, but the stupid people behind them sure do. My wife and I have a handgun we lock away in a well hidden location within our house only to be used for recreational purposes with her dad who is a huge gun aficionado. We have friends who are police officers and serve in the military, but none of these family men and women are sociopaths and all are probably far more well grounded than I am (one glance at my blog will surely be evidence of this). Thanks for this post! America needs to see that we need more than just gun control. We need people control. It seems like such a basic concept (that of personal responsibility), yet one that is so lost on so many. Thank you so much for stopping by, reading my thoughts, and giving your input. I appreciate it. The only thing that I disagree with in this article is the part about the red dress or the black dress. I don’t wear either. Other than that, we share the same view. Personal responsibility is often overlooked. I think what you’re teaching to your little one is commendable. Now is the time for that to be communicated. Very well put. Your children will be better human beings because of the lessons you are teaching them. Good for you. It’s an uphill battle, but worth the journey. This sums it up nicely. Gun control is a noble idea, but guns aren’t killing people. People are killing people. Do we have a responsibility to do our best to keep guns out of the hands of people who would use them for ill? Absolutely. Is banning guns going to stop crimes like Sandy Hook from happening. No. It hasn’t in England and it hasn’t elsewhere. Guns are not the problem, people are. As my buddy Elyse has pointed out to me, you can get rid of guns, but you can’t rid of people. This, unfortunately, is true, but we can choose as a society to pay more attention to mental illness; the diagnosis, the treatment, and the symptoms. I can tell you for a fact that society as a whole does not take mental illness seriously and most people do not get treated properly for it, and up until recently I was included in that group. So, let’s put the focus and keep the focus where it belongs. On people. On mental illness. And on finding ways to diagnose and treat people with mental illness. You do well on the soap box….well said! I completely agree with you on this. Guns aren’t necessarily the problem, people are. That’s the lesson I wanted to get across to my child. It takes someone making a choice, then taking action. As for mental illness, I have witnessed my brother battle mental illness for many years and the biggest part of the battle has been in trying to get the right diagnosis, the right treatment, and the right attention. It is beyond frustrating to say the least. Thank you so much for your visit, for reading my thoughts, for sharing yours with me, and for re-blogging. Amen….choices and consequences are the best lesson to teach from day one as a parent. You’re a good Mama, that’s for sure. And my heart stopped when I read that the “student” was also your son. That had to be a hard pill to swallow. I’m right there with you, shielding my kids from what, unfortunately, they will learn about all too soon. For now, let’s let them keep their innocence. Thank you. You’re right. They will learn all too soon about the realities of the world. Why rush them? I’m with you! I would never volunteer such horror to my children, especially at a tender age. As for choices, I don’t believe in leaving things to chance. Life is is a sum total of choices. Some good, some bad. Either way, there is a consequence for every decision. Even now, I teach my children about cause and effect. Great post! I’m big on teaching my kids that each of their choices has consequences and they should always consider the consequences before taking any action. Hopefully, the fact that we are teaching them this young will create a good foundation for the future. I had to talk to my kids about it. They saw the news reports. I told them the teachers did everything they could to protect the kids in the school. My girls are still confused though. They think America is a great place and somewhere we would like to visit. You’ve got Disney and iCarly and Wizards of Waverly Place. Very had to think their dreams have been shattered by such a stark reality. And so heartbroken for all those families. That’s what bothers me the most…having to shatter my kids idea of the world as they see it. America is a great place. Unfortunately, like anywhere else there are people whose choices affect the rest of us. 😦 Thank you for your visit! My daughters are in their teens now, so we discussed it. As I had hoped, the discussion was mature and thoughtful, and I was thrilled and thankful to hear that their opinions about it were reasoned and well-informed. I walked away from the discussion thinking that I can’t (and wouldn’t want to) form my kids’ opinions on such things…all I can hope for is that they can learn to arrive at their opinions without being easily swayed by sensationalism and rhetoric. If my kids were teenagers I would definitely have discussed it with them. However, with them being 10 and 7 and being homeschooled, I just didn’t see the need to freak them out with those details. One of the perks I guess. Your daughters sound like they are exactly the kind of kids I’m working on raising…mature, thoughtful, and well-informed. Good job Dad! Yikes. I would be shocked by that too. I also try to keep my kids away from stuff they just don’t need to know at their age! Good for you! Our children are exposed to so much and need our constant guidance to understand and make the right choices. Always enjoy your visits and thoughts! Thank you. Great words! Awesome mom! Even your son is showing wisdom from wence he came!!! Lesson: Even when we don’t talk about certain things… our kids are being formed from the foundation we build! Good job mama! Nice post! We talked about it, because we knew they would hear about it at school. But we don’t let them watch the news. Yeah, I don’t think I would have told them if I homeschooled. Why put that in their heads? You nailed this bang on! Great post! You’re doing the right thing with banning the news for your kids. Collectively, there’s a lot of crap that even gets aired on the news and sometimes things slip. I feel you’re doing the good. Personally, I wouldn’t subject my kids to this issue yet. Thanks for stopping by and sharing your thoughts. We definitely don’t tune in to the news with our children, but make it a point to discuss certain issues with them on a level they can understand. With the Sandy Hook tragedy, I just didn’t see the point in unnecessarily scaring them with the story. Maybe if they were attending a school where they would pick up that information, but since I’m homeschooling them right now I choose to shield them from certain things. We always discussed everything with our children; it was just a choice that we made. It’s a harsh world and so we decided to make our kids have a really good think about things, trying our best to present everyone’s side of the argument. Not easy, but we tried. That was our way of dealing with topics like this. We saw it as an opportunity to prepare our kids for what’s out there. It’s not everyone’s way, but each to their own choice. This is a good blog post. Thanks! My children are 10 and 7, and I definitely answer their questions honestly. I, like you, believe in preparing our children for what’s out there and arming them with knowledge on all sides. We discussed our most recent election in depth. At what age did you present these types of issues in the news to your children? I can’t remember their exact ages, but when the news came on and there were contentious issues on, we’d always explain what was going on and who was saying what and why we believed something and why other people believed things. It was a way to get them to think from different points of view and question everything. We told them never to believe anything they were told, but to dig deep to see what their feelings about something were, and always to only have an opinion when they had explored all the facts. As adults they turned out to be very mature and kind of laid back as a result, never fanatical about anything. Yeah, we spent much time discussing and explaining to the children both points of view during the elections. One thing we kept emphasizing was the importance of doing their research on both sides of an issue before coming to a conclusion. Thanks for your input! Thank you Terry. It’s a fine line we walk as parents raising children to be personally responsible. I just don’t think at my children’s ages they need all those details just yet. One choice at a time.